Famous for quality, Swarovski crystal beads add eye-catching sparkles to our music themed necklaces. At TAF Music Gifts we create some elegant designs using these beautiful beads to enhance the pendant. The prices of the necklaces vary depending on the material of the wires and the complexity of individual style. We currently have 3 musical necklaces for you to choose from. Click on an image below for details of the individual piece. You may also be interested in our Swarovski crystal earrings or our related business Aristocrat Tiaras carries a full range of handmade Swarovski crystal tiaras, and earrings for brides and other special occasions. All Swarovski crystal necklaces and other music themed jewellery are designed and handmade in our workshop in Herefordshire UK. 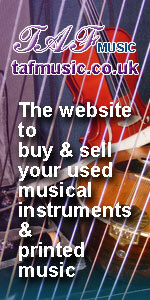 They make stunning music gifts for musicians, family and friends.